Amelia Barikin is a Lecturer in Art History in the School of Communication and Arts. Her research often focusses on the relationship between art and time. Amelia completed her art history PhD at the University of Melbourne. Prior to joining UQ, Amelia worked as a Senior Research Associate on the ARC Linkage Project ‘Large Screens and the Transnational Public Sphere’ (University of Melbourne), and has also worked as a lecturer, editor and curator with numerous Australian arts institutions including Liquid Architecture and The Australian Centre for the Moving Image. 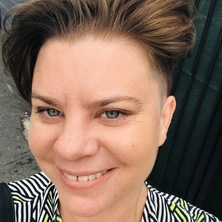 She is a member of the Research Unit for Public Cultures, University of Melbourne, an editorial advisory board member of the arts journals Discipline and emaj and a board member of Media Art Asia Pacific, Brisbane. Amelia has taught on modern and contemporary art, art theory and curatorship and has published widely. Her book Parallel Presents: The Art of Pierre Huyghe was published by MIT Press in 2012. Her co-edited anthology Making Worlds: Art and Science Fiction was published by Surpllus in 2013. In 2015, she co-curated the major exhibition 'Pierre Huyghe: TarraWarra International 2015' at TarraWarra Museum of Art. She is currently researching the intersection of art and science fiction. 2016 Stanislaw Lem Reading Group, Biennale of Sydney, Carriageworks 24 April; 'Everywhere all at once: time travel and contemporary art', public lecture Wellington City Gallery, New Zealand 21 June; 'Nicholas Mangan: Limits to Growth', public talk Monash University Museum of Art 12 July; 'Frontier Imaginaries', panel discussion QUT Art Museum, Brisbane 13 August; 'Mineral Volumes', Materials of Sound Sympsosium, Artspace, Sydney 24 August; 'Art in the Time of Colony: conversation with Khadija von Zinnenburg Carroll', IMA Brisbane 15 October; 'The Future of ARIs', public panel discussion, BARI Festival Brisbane Powerhouse 20 October; 'ACMI Podcast: Philippe Parreno', October 2016; 'Philippe Parreno: In Conversation', ACMI Melbourne 6 Dec, 'Curating Publics, Curating Spaces', University of Melbourne 8 December. 2015 Museums and Galleries NSW Curator Residency Grant, TarraWarra Museum of Art 2015; Public lecture 'In Dreams: Lynch and Surrealism', GOMA March 2015; Panellist, UQ Art Museum 'The Places You'll Go!' March 2015; Presenter, 'Animism and Material Vitality' conference; Auckland AUT June 2015; Curator's tour, TarraWarra Museum of Art, August 2015; Screening and public talk, 'Pierre Huyghe: Untitled (Human Mask)', Australian Centre for the Moving Image, September 2015; Public lecture, 'Being After Time: Towards a Mineral Ontology of Contemporary Art', Mildura Biennale, October 2015; Public lecture, 'Sound Fossils and Arche-Fossils', Gertrude Contemporary, Melbourne October 2015; Presenter and co-convenor, 'Time out of Time', TarraWarra Museum of Art, October 2015; Public lecture for 'Worlds within Worlds', Academy of Fine Arts, Helsinki, December 9 2015. 2014 AGNSW Residency Scholarship, Cité Internationale des Arts, Paris, March-May 2014; Invited panellist, 'Draw Me a Discovery: Café Scientifique', Brisbane, 19 June 2014; Invited keynote respondent 'Art Out of Time' symposium, Oxford University UK, 26 June 2014; Continuing Professional Development Seminar for 'The Melancholic Imagination', University of Queensland, 30 August 2014; public exhibition tour of 'Stuart Ringholt: Kraft', Institute of Modern Art, Brisbane, 20 Sep 2014; public symposium co-convenor and presenter at 'Triple Oh! Symposium: Art and Object Oriented Ontology' UQ Art Museum, 27 Sep 2014; Session Chair, 'The Life of Things', EMSAH WIP Conference, University of Queensland, 29 Sep 2014; Judge, Dr John McCulloch Memorial Prize, Univeristy of Queensland, 30 Sep 2014; conference paper for public symposium 'The Persistence of Melancholia: Melancholia and the Arts 1514-2014', UQ Art Museum, 23-24 October 2014. 2013 'Making Worlds', public reading and book launch at Motto Melbourne, 5 Sep 2013; 'The Future is Noise', public panel discussion with Greg Hainge and David Toop, IMA Brisbane 22 Aug 2013; 'Art and Science Fiction', radio interview for 4ZZZ, Brisbane, 14 June 2013; 'Making Worlds: Art and Science Fiction', conference paper, ISEA, University of Sydney, 12 June 2013; 'Large Screens and the Transnational Public Sphere', roundtable with Nikos Papastergiadis, Scott McQuire, Ross Gibson, Cecelia Cmielewski, Audrey Yue and Xin Gu, ISEA, Sydney, 12 June 2013; 'Memories of the Future: On the Time of Art', public lecture, Institute of Modern Art, Brisbane, 11 April 2013; 'The Paper Trail: History and Archives in the Work of Thomas Demand', public lecture, National Gallery of Victoria, Melbourne, 15 March 2013. Making worlds: art and science fiction. Edited by Amelia Barikin and Helen Hughes Melbourne, VIC, Australia: Surpllus, 2013. Quantum entanglements and the construction of time: do we need a science-fictional history of art?